Many companies are looking for effective tools to manage and track their field work force. As the leader in the mobile workforce management, Work Force Tracker™ provides a collection of powerful tools to improve productivity and lower operational costs of managing field employees and operations. Work Force Track users come from all kind of businesses managing every thing from field sales to field services. Work Force Tracker is a powerful & highly customizable Mobile enabled solution with best-in-class features for managing your field work force. 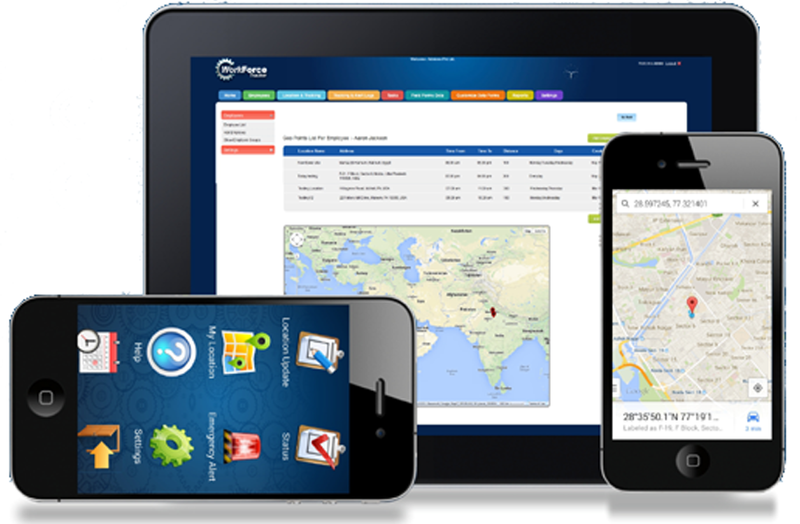 It provides Employee Location Tracking With Advanced Geo-fencing Capabilities, Location Maps, Security Alerts, Daily Time-sheets, Task Assignments and Job Scheduling, Client Management, Employee Messaging, Custom Data Forms for Field Employees, and many more advanced features needed to run complex and diverse field operations. With Work Force Tracker™ you can do all above and more. Your field employees can update their status, submit time sheets, task reports and expense sheets, customer data and more. At the same time, they can request emergency services from the field. In a turbulent world full of many unpredictable events, employers can have peace of mind that they know at all times where their field employees are. If they are on lunch or a customer site, travelling or staying in a hotel, you will know their where abouts. 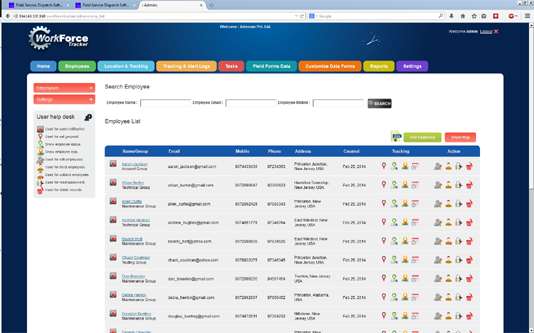 The companies have access to a simple web console to track their employees. Field employees can use our feature rich yet simple to use Mobile Apps to update task locations, generate invoices, or submit field reports and timesheets saving time and money for you! WorkForce Tracker is a powerful tool to help you manage your field workforce. Unlike Field Force Tracker, World's Leading Field Service Management Software, Work Force Tracker is flexible and can be used to manage Field Sales Teams, Package Pickup and Delivery, Courier Operations, Employee GPS tracking, Mobile Based Data Collection, Scheduling Client Visits, Remote Site Installations, Construction Site Reporting, Field Sales Team Management, and even for some Field Service Operations. The Work Force Tracker users come from all industry verticals. Knowing where your employees are at a given time is very re-assuring. Work Force Tracker™ provides businesses with the easiest most efficient ways to manage field employees, their time, tasks and productivity. With advanced field mobile solutions, custom data forms & seamless integrations with external software systems such as invoicing, telephony and security notifications, companies love the software. There is a better way to run your field operations - it all starts with Work Force Tracker! If you are looking for an advanced Field Service & Dispatch Management Solution, our Field Force Tracker will be a better solution. It will streamline Scheduling, Dispatch, Customer Management, Vendor and Employee Management, Work Orders, Equipment Maintenance, Inventory Tracking, Contracts, Estimates, Invoices, Payments and Accounting entirely on line. Work Force Tracker Features: Streamline Operations & Get More Done. Work force Tracker software is designed to give you a bird's eye view to all your field staff on a Web dashboard. You know where they are at all times. So, if they need any help, you can arrange one in minutes. Needless to say, knowing location is important for field task assignments (specially for pick-ups, deliveries, custom notifications),reporting etc. There are many more advanced features such as location geo-fencing based alerts, status updates etc.. Workforce Tracker is a unique product that combines features of employee security, and work force productivity together into one comprehensive easy to use product. Businesses have legal obligations to protect their field employees from dangerous incidents. The system lets company send security alerts to their field employees. Similarly, field employees can request the help by press of a button on their mobile Phone. Employees are core assets of any business. The system keeps all data about your employees such as their contact information, their work groups and their skill levels. You can also assign them skills, areas of operations, & roles within the organization. Your employee data can be exported for other applications. Reporting tools lets you analyse the performance of field employees. You can create tasks for your field staff and assign them using highly intuitive Web interface. Our task definition is flexible to allow many kinds of tasks such as service, pick-up, deliveries, emergency planning, sales leads, on-site daily assignments etc. Assign one or more employees to do the work, either when scheduling the task, or later. Work Force Tracker’s scheduling system provides the flexibility to assign as many or as few visits as needed to get the job done. Collect data anywhere with custom forms. Work Force Tracker app allows you to design custom forms and conduct field data collection using Mobile. The custom forms provide perfect tool for asset management, field audits, inspections, and inventory applications. Work Force Tracker app is used by engineers, municipal governments, power utilities, and many more, all over the world for complete management of field operations. Click below to learn more. Businesses can quickly and easily capture detailed timesheets for field employees. Custom timesheets in line with your unique business requirements— ensure you capture the right information the first time, every time. Pre-set Forms: Mileage, Expense, Invoices etc. Work Force tracker comes standard with many data forms used by organizations. For example, you can use existing forms for mileage, expense, or invoices forms. You can also bring your own data forms. The System includes many tools to export collected data to other software programs vis csv export or via API. Integrated reporting packages allow you to create custom reports. The system is highly customizable to only choose the forms or fields that you want. Work Force Tracker includes online reporting and business intelligence tools that helps you easily analyse your business data, and create insightful reports & dashboards for informed decision-making. It allows you to easily create and share powerful reports in minutes with no IT help. You can use our built-in reports or our team can create queries that you can run again to create powerful graphics data reports. Track employees, jobs and customers in real time live! Get field updates, timesheets and invoices by smart phones.